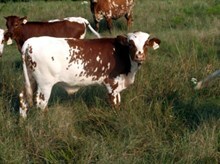 A OUTSTANDING SEBASTIAN DAUGHTER WITH A TREMENDOUS PEDIGREE AND A AWESOME SET OF HORNS! SHE WILL BE IN THE 80" CLUB SHORTLY! SHE NOW HAS A HANDSOME BULL CALF AT SIDE BY (JP RIO GRANDE) & IS BEING EXPOSED TO "ZEUS EOT 9E5"